The Orange County based plastic surgeon comments on a recent article that some due diligence by prospective plastic surgery patients is needed to ensure the best possible outcome. 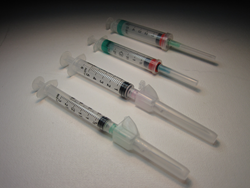 Injection based procedures are one very popular option for today's patients. Working with a skilled physician always a good idea even for simple procedures. A July 1 article in the Orange County Register reports on the ongoing popularity of all types of plastic surgery and cosmetic procedures, offering some detailed advice on the importance of insuring that procedures are performed by highly qualified doctors. Specifically, the article adds that, even for the quick minimally invasive treatments sometimes referred to as “lunch time procedures,” it’s important to have fully qualified medical personnel involved at all times. Orange County based plastic surgeon Dr. Michael A. Jazayeri says that it’s important for prospective patients to realize that, while cosmetic treatments as well as plastic surgeries are extremely safe, they are still medical procedures, and working with a skilled physician always a good idea even for simple procedures. Dr. Jazayeri notes that, for such popular plastic surgeries as rhinoplasties and breast augmentations, it’s imperative to consider only board certified plastic surgeons, which means that the doctor’s qualifications have been rigorously vetted by a leading medical organization. Even when it comes to such minimally invasive procedures as Botox and facial filler injections, Dr. Jazayeri says that it’s always ideal to have a highly qualified plastic surgeon involved for two main reasons. First, he says, an experienced surgeon can maximize the safety of a procedure because of his or her in-depth knowledge and ability to respond to any unexpected matters that may come up. In addition, thanks to their long experience and sensitivity, extremely qualified plastic surgeons also tend to have an extremely refined aesthetic sense, says the doctor. That means they are sometimes able to produce superior results when compared to medical personnel who are not plastic surgeons. Whatever kind of procedure they have in mind, Dr. Jazayeri strongly suggests that prospective patients take a close look not only at the qualifications of their medical personnel, but also past examples of their work on online photo galleries to see what kind of results might be possible with this doctor. He adds that it’s also never a bad idea to look at the how the doctor is rated by former patients on such review sights as Yelp. Dr. Michael A. Jazayeri is certified by the American Board of Plastic Surgery and has been practicing since 1999. He adds that he is an avid photographer in his spare time, which he says is an outstanding way to further explore his aesthetic insights. Interested readers can learn more by contacting the doctor’s office at (714) 834-0101 or visit http://www.drjaz.com. Dr. Jazayeri has offices in Newport Beach and in Santa Ana.